ASA has built a reputation for providing the aviation community with the most accurate and reliable FAR/AIM products available. The 2019 FAR/AIM book continues this tradition, containing complete and up-to-date information from Titles 14 and 49 of the Code of Federal Regulations (14 and 49 CFR) pertinent to General Aviation, Sport Pilots and Flight Instructors, combined with the Aeronautical Information Manual (AIM), and a free email subscription service for you to receive updated information as it is released by the FAA. Parts 1, 43, 61, 67, 71, 73, 91, 97, 103, 105, 110, 117, 119, 135, 136, 137, 141, 142, NTSB 830, TSA 1552 and the complete Aeronautical Information Manual. Sport Pilot and Transportation Security Administration (TSA) rules included. Pilot's Bill of Rights and the new "HR 5900" public law affecting ATP training and certification. FREE updates available online and via email keep readers up-to-speed on regulation changes as they are released throughout the 1-year book lifecycle. Sign up on our FAR/AIM Updates page. ASA's FAR/AIM books have been the standard regulatory reference of the industry for more than 30 years. ASA consolidates the FAA regulations and procedures into easy-to-use reference books of information pertinent to pilots, flight crew, and aviation maintenance technicians.ASA has built a reputation for providing the aviation community with the most accurate and reliable FAR/AIM products available. 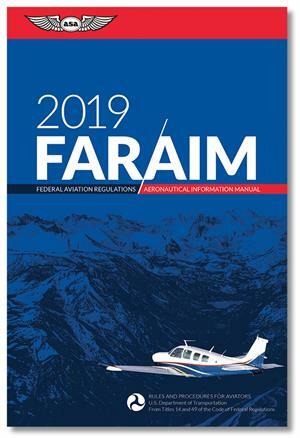 The 2019 FAR/AIM book continues this tradition, containing complete and up-to-date information from Titles 14 and 49 of the Code of Federal Regulations (14 and 49 CFR) pertinent to General Aviation, Sport Pilots and Flight Instructors, combined with the Aeronautical Information Manual (AIM), and a free email subscription service for you to receive updated information as it is released by the FAA. ·Parts 1, 43, 61, 67, 71, 73, 91, 97, 103, 105, 110, 117, 119, 135, 136, 137, 141, 142, NTSB 830, TSA 1552 and the complete Aeronautical Information Manual. Sport Pilot and Transportation Security Administration (TSA) rules included. ·Pilot's Bill of Rights and the new "HR 5900" public law affecting ATP training and certification. ·The most complete and up-to-date information available. ·FREE updates available online and via email keep readers up-to-speed on regulation changes as they are released throughout the 1-year book lifecycle. Sign up on our FAR/AIM Updates page. ·User-friendly combined FAR and AIM index with more terms than ever before! ASA's FAR/AIM books have been the standard regulatory reference of the industry for more than 30 years. ASA consolidates the FAA regulations and procedures into easy-to-use reference books of information pertinent to pilots, flight crew, and aviation maintenance technicians.